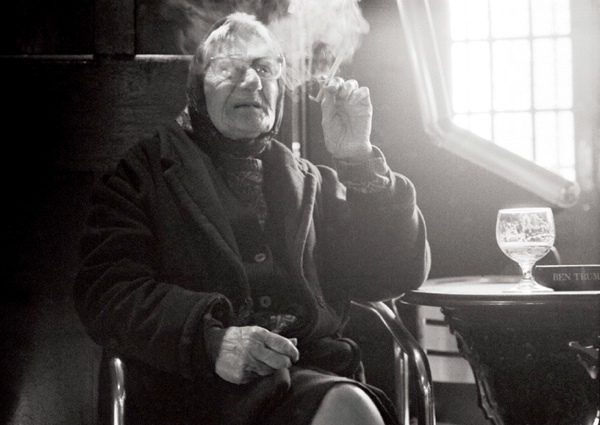 When Sandra Esqulant, celebrated landlady of The Golden Heart in Commercial St, saw this photo taken by Phil Maxwell of Rose sitting in her barroom twenty years ago – which is published in my Album - she told me the story of an unforgettable character who became one of her most loved regulars. “I loved Rose. I don’t know what happened to her, she’s got to be dead now hasn’t she? What happened was – you know how you fall in love with some people? – this woman appeared in the pub one day and I fell in love with her. I just liked her. She asked for a rum & lemonade, and she never had to pay for a drink in my pub. I used to have to warn everyone when Rose was coming in because she used to pick up everyone’s cigarettes and put them in her bag. I used to dance with her. You might think she was dumb, but she was the most astute person I ever met. She didn’t like my husband while I was there, but when I wasn’t there it was a different story! My husband liked her a lot. You know I lost my husband. When she stopped coming, I went round to the Sally Army in Old Montague St, where she lived, but they told me they didn’t know what happened to her, so I went to the Police Station and they were going to search the morgue. I kept going back to the Sally Army and this Irish woman said to me, ‘Are you looking for Rose? She moved to Commercial Rd.’ So I went round to the Commercial Rd shelter and there was Rose. She was very sad because the Sally Army had put her out after forty years. So I used to send a cab to pick her up and take her back from my pub. The Sally Army, they should have known how fond I was of her and told me where she had gone. 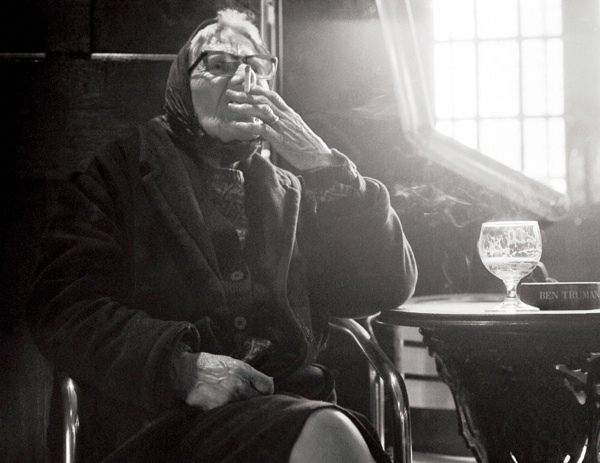 One Sunday, when I was on my own, she collected all the glasses and the ashtrays and the crisp packets and emptied them over the bar. I didn’t mind, Rose could do anything in my pub. 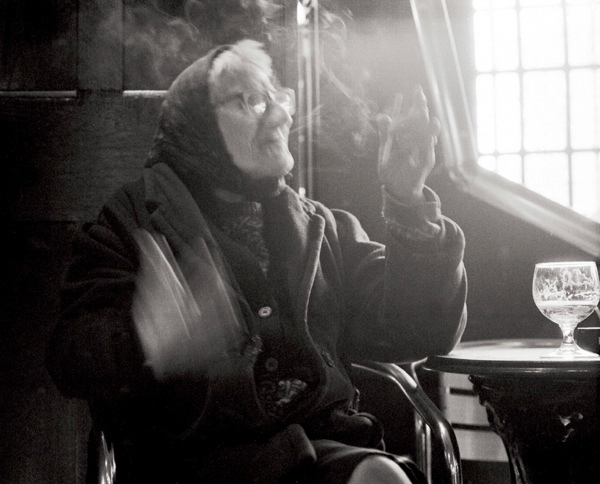 People like Rose would go into a pub and people wouldn’t serve them, but I had everyone in here – this was the dossers’ bar! One day, Phil Maxwell asked Rose if he could put her in one of his films and she didn’t like that, but he set his camera on the table and took these pictures. And after that, he always had her picture in his exhibitions. She must have known I was fond of her. I know she liked me. She used to talk about her daughter, but I sometimes wonder if she ever had a daughter. At Christmas, she always asked me for a Christmas box and, of course, I always gave her one. 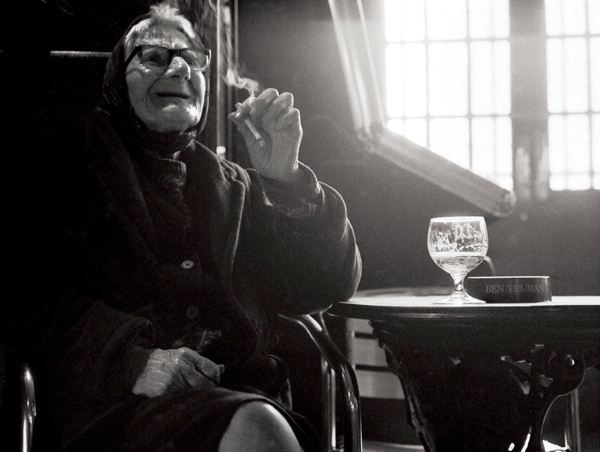 They moved her out after forty years, what a thing to do to someone. 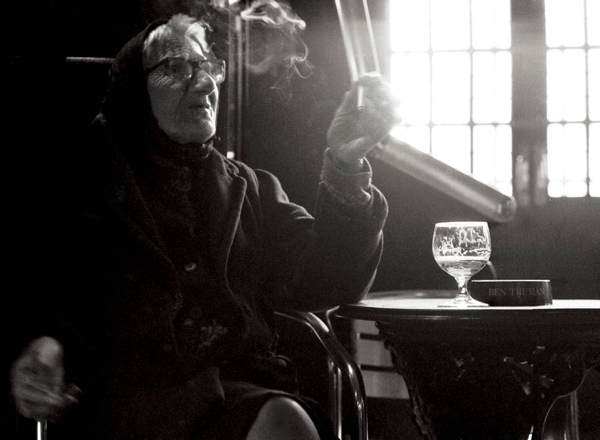 If Rose was here today, I’d let her smoke in my pub – I don’t care about the law. I look forward to reading your blog every night. Yes, night (well, actually 2am)- because I’m not in London- not even in the UK, but in the US, and though I’ve been to London, it’s been quite some time, and I don’t think that I’ve ever been to Spitalfields. However, your wonderful stories and photos make me feel like I’m there, and though I look forward to actually going in the near future, I think part of me will always prefer to see Spitalfields through your eyes! Thank-you so much. There are people who have special gifts as in Edward Thomas’s poem old Jack Noman down the lane. Not an hour of the sun had been wasted on Jack. Then I can’t buy.’ ‘I don’t want to sell. Wait till next time. The better the day . . . This is what it’s all about, isn’t it? Giving some one a place to be themselves. Give them love and respect and kindness. You have a big heart Sandra Esqulant. What an amazing character I would have loved to have met her. Where is she now I wonder? Still emptying crisp packet wrappers over the bar in another public house. It’s difficult to believe she left the comforts of the Golden Heart voluntarily; free rum and lemonade and other peoples fags what more could she want. 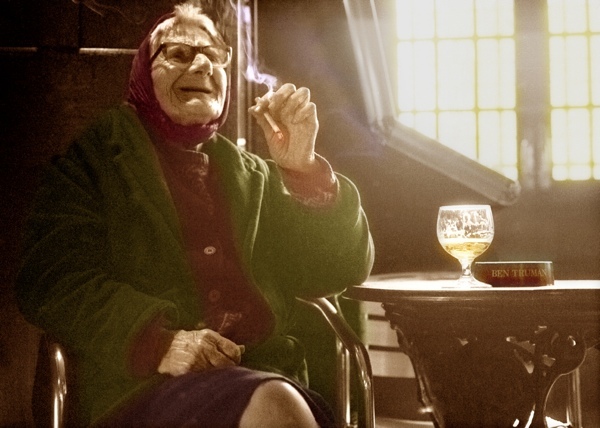 Many thanks to Phil for capturing these wonderful images of her ensconced in her favorite seat, cigarette in hand, her face illuminated on one side by the sunlit window. I can sense the atmosphere, smell the smoke, hear the laughter. It’s the next best thing to actually being there. 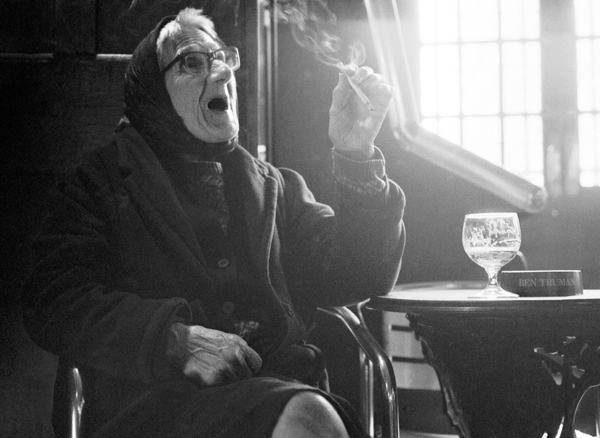 Many of the old characters have been driven out of the Pubs. There are still a few to be found but they are few and far between. I would love to be able to photograph some of the old characters but I find it very difficult to approach them. I can go back nearly 40 years of visiting various Ale Houses and the change has been phenomenal. What is left is mainly characterless and void of personalities. Great blog. Thanks. I remember ROSE, I sometimes use to see her walk past my stall in Club Row market, Sclater St on Sunday morning’s, I never actually spoke to her but I remember her being around, to be honest, I had forgotten all about her until I saw her photo on hear, sadly, she was part of a long list of old character’s that I no longer see in the market anymore, maybe soon, other people will be adding me on to that long list ? I cried when I read this, I wish I’d met Rose. Sandra Esqulant saw the beauty in her as I see in Phil Maxwell’s photos. Sandra can’t find her now and suspects she’s passed away. A touching story, told with affection.